My thoughts and prayers are with all those who are going to be dealing with huricane Florence. Agreed, thoughts and prayers to all, and gratitude to those going into harm's way for emergency response. 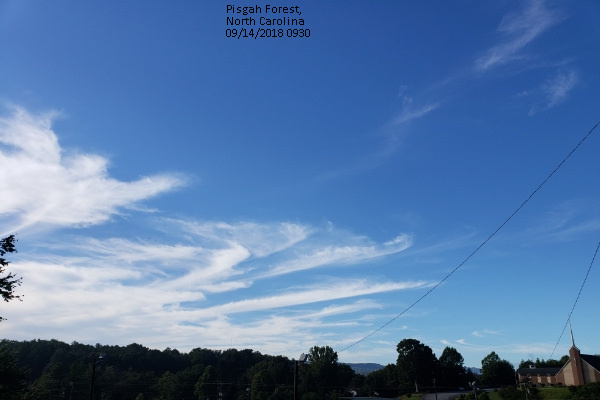 Although the storm's winds are forecast to greatly diminish in western North Carolina, the following photo of what might be among the farthest visible storm-related clouds this morning. Looking southward, to the left (east) note the curved clouds. outermost clouds from Florence starting to arrive. And another amen from here. I'm praying that the rain won't be a severe as predicted.